R&B, Funk, New Orleans, Jazz, Live hi quality venue recording at dba, New Orleans Fan Favorites! The iconic New Orleans band issues its first sanctioned LIVE release: 13 cuts representing fan favorites that showcase the diversity of the band’s material. By demand of the regular fans who see him weekly at dba nightclub on Frenchmen Street, this release includes fixtures of the set, many of which have been out of print for years. "Recording Live at dba is a natural. It's like our home venue," said Roadmasters' bassist Jack Cruz. The 24-track venue recording was mixed by multi-Grammy, multi-Platinum engineer, Dave Farrell of Ultrasonic Studio, whose other artists include Gatemouth Brown, Harry Connick, Jr. and Aaron Neville. Washington is best known for fronting his own band since the 1960s as well as his now fabled stint with “The Tan Canary” Johnny Adams and on and off gigs with Lee Dorsey and “The Emperor of The Universe,” Ernie K-Doe. While Walter has over a dozen records under his name, this is only his second release in 13 years. 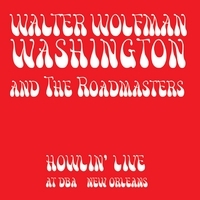 Some of his most fruitful efforts have been with The Roadmasters, but since this is a live recording, it is the first time they have shared the billing on a record.